Qurban Bayram: How do Muslims celebrate a holy feast? Sacrificing a living creature for the sake of God exists in many religions. In general, a livestock is sacrificed. But, there were communities living in antiquity periods that even sacrificed people, like the Aztecs, Egyptians and Phoenicians. Jews used to sacrifice their fields' first harvest and the first offspring of an animal. In Islam, a Muslim with a certain income is required to sacrifice a sheep, goat, bull or camel. The Quran pays special attention to this religious duty and the Prophet Muhammad also sacrificed animals throughout his life. In Arabic, "eid al-adha" means the Festival of Sacrifice – Kurban Bayramı in Turkish. The word "adha" refers to the plural form of "udhiyya," meaning sacrifice. Giving a sacrifice is a very big example of the giving of oneself. In Turkish, the phrase: "Let me sacrifice myself to you" – Kurban olayım – which means: "I can sacrifice myself on the path of God, which created you," is the biggest compliment made to someone you love very much. The word "kurban" (Qurban) in Turkish implies the meaning of being close in Arabic. Muslims want to get close to Allah through sacrifice. The sacrifice of an animal can be practiced on Qurban Bayram taking place on the 10th, 11th, 12th and 13th days of Dhu al-Hijjah, the 12th month of the Islamic lunar calendar. These days are also the times when pilgrims perform the hajj to Mecca. It is allowed to sacrifice an animal on other days, but it is regarded as a voluntary practice. An animal is sacrificed, as it is a divine order, and this practice shows one's faith in God. At the same time, sacrificing animals indirectly contributes to world peace, as it fulfills the human instinct of shedding blood. Sacrificing animals is also a means of social assistance. A sacrificed animal's meat can be eaten and its hide can be used. The Prophet Muhammad recommended dividing its meat into three parts and distributing it among needy people, neighbors and relatives. He advised to leave only one part for oneself. More than one animal can be sacrificed and this is because wealthy people in the Islamic world do not confine themselves to sacrificing only one animal. By doing so, the meat can be distributed to many poor homes. The origin of the sacrificing practice dates back to the time of Abraham – known as Ibrahim in the Islamic world. He once made a vow that if he had a son, he would sacrifice him for the sake of God. He then had a male child and remembered his vow. Abraham's son was Ishmael. His son told him to do what was ordered. Satan tried to hinder him, but failed. After all, God rewarded Abraham because he kept his promise and trusted in God against this incident. A beautiful ram was sent from heaven and Abraham sacrificed it. They cooked the ram's liver and ate it and then distributed its other parts to poor people. Among Muslims, cooking a sacrificed animal's liver and eating it is derived from this story. The same story is also told in the Bible. However, the Bible mentions Isaac as the sacrifice, as opposed to Ishmael. In Islam, a certain amount of wealth is required to sacrifice an animal. At the time of the Ottoman Empire, there was hardly anyone who did not sacrifice an animal. This was because livestock was cheap. Because there were no proper storage facilities like refrigerators, meat used to be found very rarely. In rural areas, local people owned a sheep herd, either large or small. They sacrificed one on Qurban Bayram. On the other side, urbanites saved money spent on meat to sacrifice an animal. Poor people roasted the meat and carefully consumed it throughout the year. Most people sacrificed their animal by themselves. Those who do not know how to slaughter an animal for sacrifice used to find a butcher and pay them for the service. The gardens of houses were generally available to sacrifice an animal. There was also land available so that locals did not see streets polluted with blood while animals were being sacrificed. The animal to be sacrificed is respected with a holy attitude. It is not pulled to the place where it is sacrificed, but instead its eyes are fastened and turned to the direction of the Kaaba. Then an experienced person sacrifices while saying prayers. This practice is not done in front of other animals. The animal's blood is drained into a hollow and its inedible innards are buried. All these practices are done in line with a religious ritual concept. After sacrificing an animal, its owner says a prayer. Female animals are not generally preferred as they give birth to offspring and provide milk. A camel or bull can be sacrificed by up to seven people altogether. 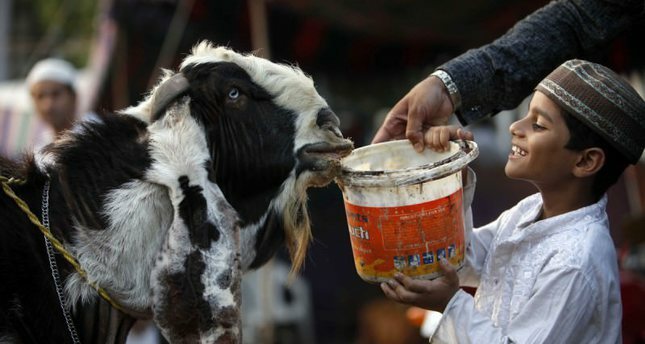 In the past, the animal was bought a few days before Qurban Bayram, looked after in the garden, hennaed and embellished. Following the prayer, it was sacrificed. Children were brought to the sacrifice to make them get familiar with the act. The animal's blood was spread on their foreheads and they were consoled by telling them that the sacrificed animal will meet them in heaven. During Qurban Bayram visitors are served desert and cooked meat from the sacrifice. In earlier times, if Qurban Bayram occurred between a couple's engagement and wedding days, then the groom was expected to send a ram to the bride's home. The ram was hennaed, decorated and gold coins were placed on its horns. Many animals were also sacrificed at the Ottoman palace. On the morning of Qurban Bayram, rams that had been decorated outside the city walls were brought to the palace in a grand style. They were sacrificed with a ceremony overseen by the sultan. The sultan used to sacrifice 40 animals. The palace residents watched the sacrificing from the windows. Following the ritual, all the meat was distributed to the poor.